Do you suffer from frigophobia, carnophobia or Anglophobia? Do you fret about peanut butter sticking to the roof of your mouth? Do you secretly fear that somewhere, somehow, a duck is watching you? Everyone is afraid of something – heights, the dark, confined spaces – but what if your fear was that ducks are watching you? Or that peanut butter might stick to the roof of your mouth? What would you call this fear? 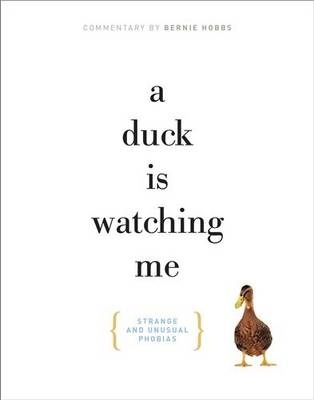 A Duck is Watching Me: Strange and Unusual Phobias explores the wild and weird world of phobias. An introduction by science broadcaster Bernie Hobbs explains what a phobia is, and where they come from, with the remainder of the book giving names and definitions for a vast array of phobias, each illustrated with a photograph from the National Library of Australia’s image collection. Images chosen range from the quirky to the hauntingly beautiful and, while they do not show people exhibiting the necessary phobia, they instead relate in some way to the subject of the phobia. For example, the entry for nomophobia, the fear of losing mobile phone contact, is illustrated by a black and white image of old style telephone repairmen. This is the kind of book which can be browsed cover to cover or left to be dipped into, and will be enjoyed by people of different ages and interests.